360 pasta meals to fit the time you have available. Cook the 10-, 20- or 30- minute version and you'll have delicious results every time - whichever recipe version you use. This versatile collection of 360 recipes is perfect for the busy cook. 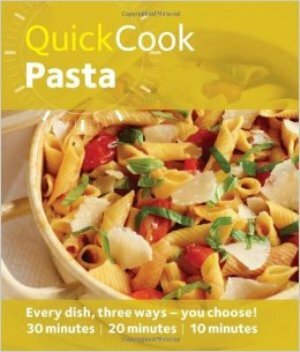 In this innovative book, you can dial the basic recipe up or down to suit the amount of time you have. Just choose the version that suits you. If you are pressed for time, then the 10-minute option gives you clever short cuts. A few more minutes to spare? Using the 20-minute version, your meal will be on the table in 20 minutes or fewer. Have the time to spend a little longer to add something special? The 30-minute variation is the one you need. Whether you are cooking for hungry kids or feeding a crowd for dinner, the Quick Cook series puts you in the driving seat with a fantastically flexible approach that allows you to cook just what you want, in exactly the time you have available.